Stepping inside this mountain home you can't help but feel relaxed. The owners have gone out of their way to furnish Tincup Cottage with the most sumptuous and comfortable pieces available. From the leather couches and chairs to the one of a kind cabinets and artwork, this is a home that will help you forget work and totally relax. However, staying connected in this home is easy with the high speed WiFi and new flat panel TV's. Not into technology, then pull up to the fantastic game table in the club room and deal out a hand of poker, or go fish (depending on your skill level). This home is setup for family and friends with the ability to sleep 10 and room to spread out, there's not another home in the neighborhood like this one! Do you ever get tired of climbing stairs just to bring in the groceries in CB? With this home there are no worries, with a ground floor living, kitchen, and dining, you are assured of the whole family joining in on the festivities. Sink back into the luxury leather furniture in the living room or sit around the farm table with family to share a meal while the gas fireplace takes the chill out of those great mountain evenings. The warm colors and the hardwood floors all combine to provide total relaxation. Downstairs is a wonderful club/media room with game table and a great leather pit group with large flat panel TV for watching movies. Also on this level is the bunk room with two sets of bunks and a full bath. In addition, there is a full size washer and dryer should you have the urge to do laundry on vacation! The 2nd floor of the home has 3 bedrooms and 2 bathrooms. The master bedroom has a king with it's own private bath. The second bedroom has a queen and the third bedroom has two twins.These two bedrooms share a full bath just outside their doors. With walk in closets and leather seating in all the bedrooms, life couldn't get much easier. So load up all of the family and close friends and head over to Tincup Cottage. Your vacation home away from home! Iron Horse Property Management was excellent to work with, everything was well organized. I received communication from their office regarding local activities as well as directions, and check in and check out procedures. I would highly recommend them simply because of their efficiency! 103 Tincup property was perfect for our family of 9. The house is in excellent condition, was well equipment with basic + needs , and was as described (no surprises). We would definitely stay again!!! Fantastic home! Great location! We plan on staying here again on our next visit!! Thanks! Iron Horse staff....wonderful! We had two families stay over spring break and we thoroughly enjoyed this property. The furnishings are high quality, comfortable, and lovely. We really enjoyed this home and would love to come again! We loved our time at this property. The space was big enough for 2 families of 4 and it was in a great location. We took the bus to the mountain and were able to walk home at the end of the day. We will look to stay in this place again on our next trip to Crested Butte. I only had a few questions that were addressed quickly and professionally. You all have been super to work with. We had a fantastic stay in Mt Crested Butte, made even better by the fabulous home we were able to stay in. We loved it. The house is very comfortable and felt like home. Wish the colors were a little lighter or better lighting...felt very dark. That is the only criticism I can think of! The kitchen is well equipped, beds comfortable, bathrooms had enough towels etc. One of the best rentals we've had in a long time! Katie was super accommodating and a pleasure to work with. She was very helpful especially when we needed an additional property to accommodate all of our needs. Tin Cup is a fun property. We had a great time in CB and loved the location of this house. We had a little trouble regulating the heat both upstairs and in the lower level. Upstairs was too hot and the basement area heat didn't really work. But, it was just fine otherwise. MANAGER RESPONSE Thank you for letting us know about the heating issue. We replaced the thermostat in the basement after your stay and all is working properly now. We look forward to having you stay with us again. Safe travels! Very easy and friendly to deal with. Our entire group had a fantastic time and would love to return. Crested Butte is terrific and the house was just what we needed. Hope to return soon. Our entire group had a fantastic time and would love to return. Crested Butte is terrific and the house was just what we needed. We had an absolutely perfect time at the Tin Cup Cottage in the Pitchfork community. The house had everything we needed to celebrate family and my oldest daughter's wedding. We could socialize at the house, share meals and then retreat to comfortable bedrooms. Neighbors were welcoming and I can't think of a single negative element. 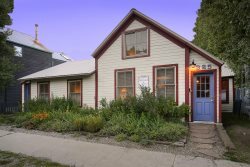 The location is great because it's a quick jaunt to Crested Butte and you're right at the mountain for all the amenities. The Tin Cup Cottage was simply wonderful. When I first made reservations the team was very friendly and helpful. Absolutely loved the Tincup cottage. The setup was great: from cooking meals to playing games and just around the corner from the shuttle if you didn't want to drive. Everyone had a real comfy bed to sleep on and not a sofa bed. Will stay here again! Our family LOVED the Pitchfork Cottage. It was homey and comfortable. From cooking family meals to board games at the table we had an awesome time. Everyone had an actual mattress to sleep on - always a plus. The shuttle was right around the corner. Eat at The Secret Stash if you love pizza! We enjoyed mountain biking and hiking. Will stay here again if it is available. Iron Horse was the only property management group who had a live person that I could talk to about the property. Katie was fantastic and when I had a small glitch with the online application, she walked me through everything. That made the difference and the availability of a staff member to ask some specific questions about the property was fantastic. When we had a small issue with the property, a staff member came quickly, resolved the issue and made our stay even better. We rented the Tincup Cottage for my oldest daughter's wedding. I was able to provide accommodations for family and it was perfect. The wedding was remarkable on Ten Peaks and the Tincup felt like I was staying in my own home. Perfectly appointed and neighbors were wonderful as well. It helped make the whole experience memorable. Thanks so much for a fantastic experience. As stated earlier, I was very impressed with Jennifer - in our e-mail communications, in our phone conversations, and her "follow-through" of our issue with the Wi-Fi at the cottage. I don't have anything else to add to my previous comments. We were very pleased with our stay. Well done!!! !